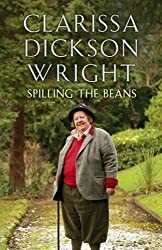 I’ve left it a bit too long to write about Spilling the Beans, Clarissa Dickson Wright’s autobiography because I’ve now forgotten much of the detail. It’s a book I really enjoyed, but I finished it nearly two weeks ago! I’ve been feeling a bit under the weather recently with a rotten cold and although I have been reading I haven’t been able to summon up enough mental energy to write much! Clarissa Dickson Wright was an English celebrity chef ‘“ one of the Two Fat Ladies, a television personality, writer, businesswoman, and former barrister. She died last year on 15 March in the Edinburgh Royal Infirmary. Clarissa was a huge character in more than her size! Her autobiography is fascinating, coming from a privileged and wealthy background she had a difficult childhood- her father, a well respected surgeon was also an alcoholic who beat his wife and Clarissa. After her mother died she took comfort from alcohol and at the mid point of the book she was as she described it ‘˜sunk in gin’ and homeless. I am looking forward to reading about her road to recovery. She then went on to tell about her ‘dark night of the soul’ and her time at addiction centres, the treatment and her eventual recovery. All this took years and she was very honest and open. She also wrote about her bookselling experience – all totally news to me – her time at ‘Cooks for Books’ changed her life and later after she had moved to Scotland in the late 1980s she ran the Cook’s Bookshop in Edinburgh near the Grassmarket. She was declared bankrupt three times, was rector of Aberdeen University for six years. And then, of course, there were her TV shows – Two Fat Ladies, with Jennifer Paterson and Clarissa and The Countryman with Johnny Scott. She was a staunch supporter of the Countryside Alliance, against the ban on foxhunting . Despite all her difficulties and her alcoholism this is an upbeat autobiography, ending on a positive note: “Believe me on one thing: I have a splendidly enjoyable life”. And believe me this is a ‘splendidly enjoyable’ autobiography. My copy is a hardback book, which I bought, but it is also available in paperback and ebook. For another review see Cath’s blog Read Warbler. Jodie Roberts liked this on Facebook. Thanks, Jodie – I’m on the mend now. I remember her Two Fat Ladies show with fondness. Those two were very funny. Sorry to hear you’ve not been too well. Same here to be honest… lot of it about at the moment. Glad to hear you’re getting better anyway. My goodness she did live a varied and interesting life. Enough for three people let alone one! Such an enjoyable, interesting book. I was so sad to hear of her passing away last year. Oh, yes, I remember you mentioning this one, Margaret! I’m very glad you enjoyed it. How amazing that she went from homeless to ‘celebrity chef.’ What an absorbing story! Hope very much that you’re feeling better now. I really enjoyed this one too, she was quite a character. I went into her shop in the Grassmarket quite a few times but never did see Clarissa there. I’m glad you’re feeling better now. I think I would really like this book–I always liked The Two Fat Ladies cooking show,and they were literally larger than life. I like to hear about people who have faced dire circumstances but keep enjoying life and living it fully. Great review of what sounds like an enjoyable read. All colds are rotten and should be banned! Glad you’re feeling better – enjoy your spring! This sounds like a memoir that I would enjoy — food, addiction, and Great Britain are all topics of interest.